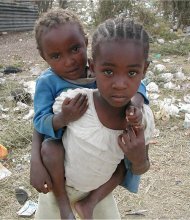 Despite some positive developments, poverty in Kenya has continued to be a huge problem. Even hunger in Kenya continues to rear it’s head from time to time. This page looks at the facts, the causes and the remedies. The dry poverty statistics in Kenya sum it all up. Somewhere between one quarter and half of the population earn less than $1 US each day (the annual GDP per capita is around $360 US). It was estimated in 1992 that half of all rural Kenyans were living below the poverty line. That represents approximately 9 million people. The situation is not quite as bad in the urban centers, where such poverty only effects a third of the population. There are several factors contributing to the ongoing problem of poverty in Kenya, though the issue of Kenya's economic state is far more complex than a simple list of causes. Around three quarters of Kenya's population is dependent on the agriculture industry, but with its erratic weather patterns and vast regions of arid desert, it is a very unstable sector. Periods of drought can be crippling, not only in terms of food supply, but in jobs as well. Even when crops have been sufficient, poor government policies and international trade terms hampered agricultural growth, leading to further declines in the industry through the 70s and 80s. Starting in 1991, further serious problems in the country's GDP became evident, leading to extended government action which has not proven to be successful at stemming the tide of poverty in Kenya. Weak overall infrastructure for the country means that nearly all the rural population are forced to rely on their own subsistence farming for their own food as well as monetary income. Jobs are scarce, leaving people with little opportunity for employment. There are considerable obstacles for starting a small business yourself in Kenya as well. Micro credits may be one way to foster small entrepeneurs. They will be important when eradicating poverty in Kenya. Protection of their own economies through tariff walls poses another problem. An increase of international trade has proven beneficial for many developing countries – look at China, India and countries in South America. But often, it’s useless for developing countries to export to rich countries because the latter have installed tariff walls. This way, products from developing countries are artificially made expensive for Western buyers. Rich countries (actually their governments) want to protect their own industries against competition this way. For example, Kenya has a blossoming flower industry that’s exporting to Europe, but recently a number of European countries have installed high new tariffs. It’s obvious that they want to protect their own industries. Their citizens pay the price. Often, progressive groups don’t mention this as a cause of Kenyan poverty, because they are ideologically opposed to free trade and free markets. The following may be a bit controversial, but I feel I have to bring it up if I want to be serious in addressing the issue. Often, behind some of the more outer causes of poverty in Kenya, lies culture: the beliefs, ideals and values that many Kenyans hold. For example, many Kenyans think an easy going lifestyle – “hakuna matata” , or “take it easy, live now and don’t make any plans for the future” – is the best way to live. While this may have it’s advantages, it stands often in the way of development and taking responsibility. 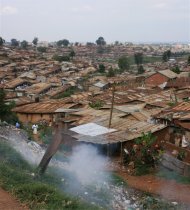 For example, when I walked in Nairobi's most notorious slum, Kibera, in 2007 it was striking how many slum inhabitants had a mobile phone, despite the abject poverty there. Another striking fact is that many Kenyans who are well off – there’s a small very wealthy class in Kenya – do little to nothing to help their country forward. The idea is that if you’re well off, you should consume it to the bottom. While you may “help” your own family and tribe – often through favoritism or even outright corruption – there is very little feeling of responsibility for the country and the population as a whole. These things have to be addresses if Kenyans are serious about eradication of poverty in their country. Of course, there are positive developments as well. It’s important to recognize and foster them. Some industries in Kenya have flourished during the last decade. They include tourism, which is the biggest source of foreign income; coffee and tea farming (Kenya is the fourth biggest producer of tea in the world); and recently the flower industry has also blossomed. Kenya is even exporting flowers to countries with a strong flower industry themselves, such as my country, The Netherlands. Within Kenya, one positive development is the introduction of free and compulsory public education by the Kibaki government. While literacy has always been high in Kenya – some 85% of adults are literate, which is a success in itself – free and compulsory public schools will further lead to development. As they say, give a man a fish and he eats for a day, teach a man how to fish and he eats for a lifetime!